Okay, the CGA Youth Golf Tournament had the hugest names- and there were few bigger than Joe Namath there, well unless you include Maury Povich who people were mistaking him for. Joe was a really cool guy, but reminded me of my grandpa. He got off the golf cart and the only thing I could look at were his knees. It was obvious that the frequent surgeries had taken their toll on him, especially when he was going uphill. He told us he was unable to sign any Upper Deck cards, since he had a contract with those, and any others he could only sign if they were personalized and would only sign one per person- but he’d sign one for everybody. I was ecstatic with that deal. 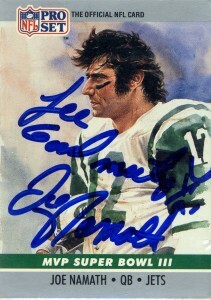 He signed mine “Lee, Good meeting ya’, Joe Namath”. I laughed because he ran out of room on the card and used an insert carat to write “ya'”. The ProSet 1990 SuperBowl card was a perfect card though, and the illustration was well worth the man who made the greatest guarantee in sports history. One of the biggest names of the upstart AFL against the NFL, Joe Namath was drafted by the New York Jets in the first round of the AFL’s 1965 draft out of Alabama. (Bear Bryant would state later that signing Namath at Alabama would be one of the best decisions he ever made.) While the St. Louis Cardinals would also draft Namath, but with a huge salary at the time on the line, would elect to go to the Jets and at season’s end would be named rookie of the year. Namath over the next few seasons would transform the struggling Jets team into a contender, culminating in SuperBowl III where he brashly proclaimed before the game to reporters that the Jets would win over the heavily favored NFL Baltimore Colts. He’d come through on that bet, and the team would help usher the AFL into the NFL merger on a high note and a fair amount of respect and garner MVP honors for the game. Joe would earn the nickname “Broadway Joe” for his engaging personality, great smile and the media circus that would inevitably follow. He would have a few notable run ins with the commissioner as well, but by 1970 Namath’s knee injuries had caught up to him. His next few seasons would be injury plagued, and in 1975 he was waived. Joe Namath would finish his career playing his final season with the Los Angeles Rams. Namath has a lasting legacy in the annuls of NFL history, as the first 4,000 yard passer and the winner of the first overtime game in NFL history. On a side note he also played in the first Monday Night Football game. Joe Namath after retirement went right into acting, where he’s had a steady stream of guest appearances in TV, film and ironically- Broadway. He has also spent a great deal of time handling color commentary, finished college and is a speaker for the March of Dimes. Namath also remains an active non-official spokesperson for the New York Jets and was inducted into the Pro Football Hall of Fame in 1985.